I rescue art and rejuvenate it with one of my poems. Rescue Art Poetry© uses the visual strength of art and the powerful words of poetry to create one-of-a-kind treasures. Give Rescue Art Poetry© a new home in your home. Note: Rescued art is not new art and may show the patina of use in nicks or other signs of being loved. 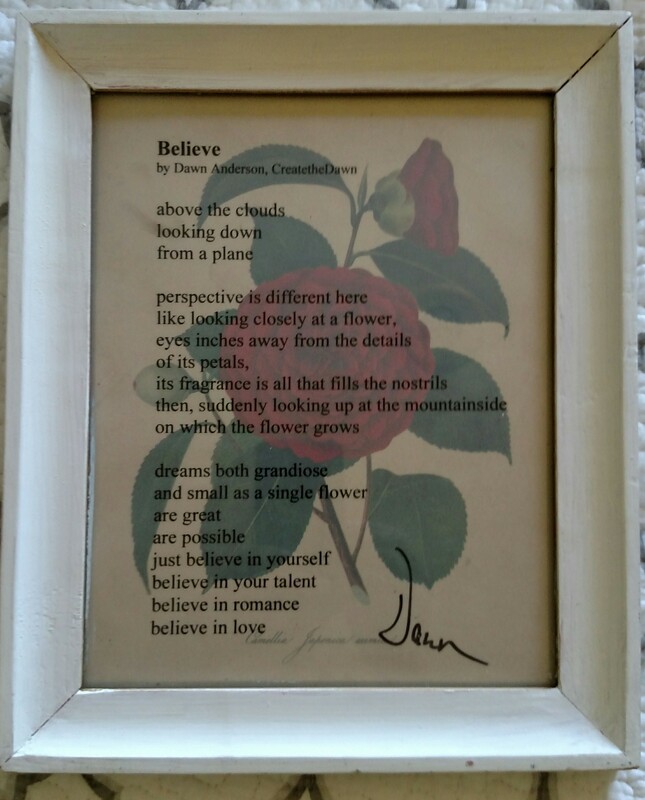 “Believe” poem over vintage art page. 9.5 x 11.5 inches. $75, free shipping or local delivery. 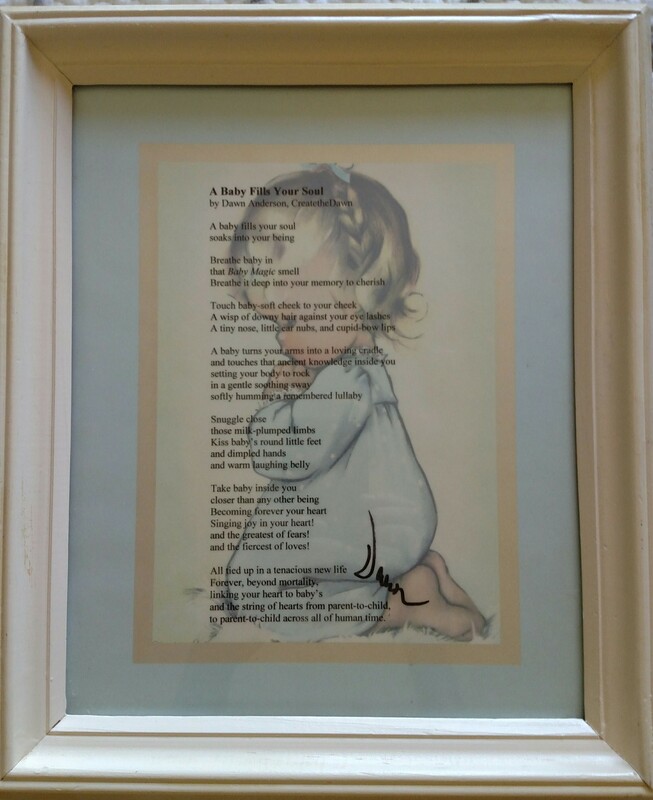 “A Baby Fills Your Soul” poem over vintage art. 10.5 x 12.5 inches. Perfect for new baby, baby shower gift, or to hang in your baby’s nursery. “Divine Purpose” poem over art print by Susan Clickner. 14 x 17.5 inches. Spiritual piece great for new grad, rite of passage, nature lover, customer service business, and inspiration. “Girlfriends Forever” poem over antique French illustration. 7.5 x 9.5 inches. Fine art great for a gift, women’s organization/business, and thank you for a dear friend. “Choose Love” poem over Hoppy Street Bedtime Story collector’s print. 10 x 10 inches. Sweet piece great for wedding, engagement, anniversary, child’s room, thank you gift to a dear friend. “Always Nature” poem over original art by M. Stabenow. 9.5 x 7.5 inches. $65 free shipping or local delivery charges. Soothing piece great for nature lover, bedside table, yoga room, inspirational gift. “Tea Party” poem over vintage art. 14.5 x 16.5 inches. $85 free shipping or local delivery charges. Elegant piece great for hostess gift, bridal shower, kitchen decor, china cabinet, coffee/tea shop. Complete contact form below to order Rescue Art Poetry© and determine shipping cost.